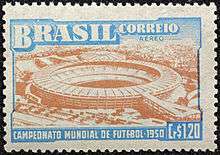 A 1950 Brazilian stamp promoting the tournament. The 1950 FIFA World Cup, held in Brazil from 24 June to 16 July 1950, was the fourth FIFA World Cup. It was the first World Cup since 1938, the planned 1942 and 1946 competitions having been cancelled owing to World War II. 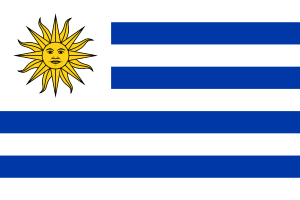 It was won by Uruguay, who had won the inaugural competition in 1930, clinching the cup by beating the hosts Brazil 2–1 in the deciding match of the four-team final group (this was the only tournament not decided by a one-match final). It was also the first tournament where the trophy was referred to as the Jules Rimet Cup, to mark the 25th anniversary of Jules Rimet's presidency of FIFA. Because of World War II, the World Cup had not been staged since 1938; the planned World Cups of 1942 and 1946 were both cancelled. After the war, FIFA were keen to resurrect the competition as soon as possible, and they began making plans for a World Cup tournament to take place. In the aftermath of the war, much of Europe lay in ruins. As a result, FIFA had some difficulties finding a country interested in hosting the event, since many governments believed that their scarce resources ought to be devoted to more urgent priorities than a sporting celebration. The World Cup was at risk of not being held for sheer lack of interest from the international community, until Brazil presented a bid at the 1946 FIFA Congress, offering to host the event on condition that the tournament take place in 1950 (it was originally planned to take place in 1949). 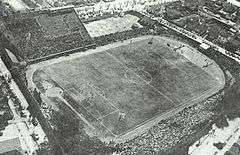 Brazil and Germany had been the leading bidders to host the cancelled 1942 World Cup; since both the 1934 and 1938 tournaments had been held in Europe, football historians generally agree that the 1942 event would most likely have been awarded to a South American host country. Brazil's new bid was very similar to the mooted 1942 bid and was quickly accepted. Having secured a host nation, FIFA would still dedicate some time to persuading countries to send their national teams to compete. Italy was of particular interest as the long-standing defending champions, having won the two previous tournaments in 1934 and 1938; however, Italy's national team was weakened severely as most of its starting line-up perished in the Superga air disaster one year before the start of the tournament. The Italians were eventually persuaded to attend, but travelled by boat rather than by plane. Brazil (the host country) and Italy (the defending champion) qualified automatically, leaving 14 places remaining. Of these, seven were allocated to Europe, six to the Americas, and one to Asia. Both Germany (still occupied and partitioned) and Japan (still occupied) were not permitted to participate in qualification. The French-occupied Saarland had been accepted by FIFA two weeks before the World Cup, several months before the German Football Association (DFB) was reinstated, while Soviet-occupied East Germany had not yet founded a football association. 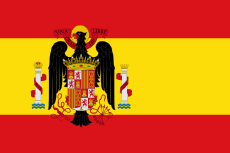 Italy, Austria, and other countries that had been involved in the World War as allies of Germany, were not subject to international sanctions, and Italy qualified automatically as defending champions of 1938. The British nations were invited to take part, having rejoined FIFA four years earlier, after 17 years of self-imposed exile. It was decided to use the 1949–50 British Home Championship as a qualifying group, with the top two teams qualifying. England finished first and Scotland second. A number of teams refused to participate in the qualifying tournament, including most nations behind the Iron Curtain, such as the Soviet Union, 1938 finalists Hungary and 1934 finalists Czechoslovakia. Argentina, Ecuador and Peru in South America withdrew after the qualifying draw (in Argentina's case because of a dispute with the Brazilian Football Confederation). 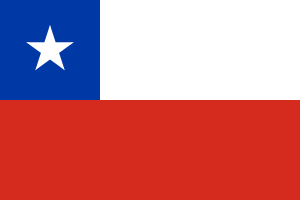 This meant that Chile, Bolivia, Paraguay and Uruguay qualified from South America by default. In Asia, the Philippines, Indonesia and Burma all withdrew, leaving India to qualify by default. In Europe, Austria withdrew, claiming its team was too inexperienced. Belgium also withdrew from the qualification tournament. 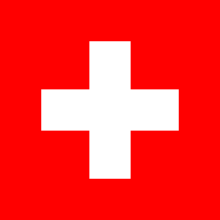 These withdrawals meant that Switzerland and Turkey qualified without having to play their final round of matches. 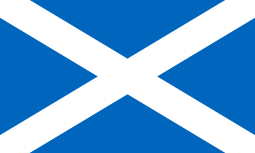 Before the qualification competition, George Graham, chairman of the Scottish Football Association (SFA), had said that Scotland would only travel to Brazil as winners of the Home Championship. 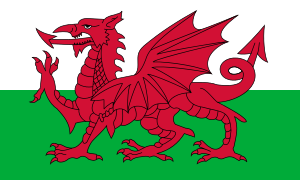 (England, by contrast, had committed to attending, even if they finished in second place). After Scotland ended up in second place behind England, the Scottish captain George Young, encouraged by England captain Billy Wright, pleaded with the SFA to change its mind and accept the place in Brazil; however, Graham refused to change his position and so Scotland withdrew from the tournament. Turkey also withdrew, citing financial problems and the cost of travelling to South America. FIFA invited Portugal, Ireland and France, who had both been eliminated in qualifying, to fill the gaps left by Scotland and Turkey. 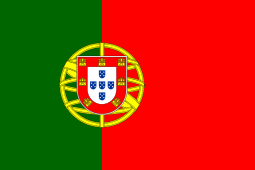 Portugal and Ireland refused, but France initially accepted, and was entered into the draw. Group 2: England, Chile, Spain and the United States. After the draw, the Indian football association AIFF decided against going to the World Cup, citing travel costs (although FIFA had agreed to bear a major part of the travel expenses), lack of practice time, team selection issues and valuing the Olympics over the FIFA World Cup. Although FIFA had imposed a rule banning barefoot play following the 1948 Olympics where India had played barefoot, the Indian captain at the time, Sailen Manna, claimed that this was not part of the AIFF's decision. France also withdrew, citing the amount of travel that would be required in Group 4. There was not enough time to invite further replacement teams or to reorganise the groups, so the tournament featured only thirteen teams, with just two nations in Group 4. Of the thirteen teams that competed, only one, England, was making its debut. Several of the Latin American teams were competing for the first time since the inaugural 1930 tournament—this included undefeated Uruguay, as well as Mexico, Chile, Paraguay and Bolivia. Yugoslavia was also making its first appearance since 1930. This would be the United States' last appearance at the World Cup finals until 1990, and Bolivia's last until 1994. The Brazilian organizers of the tournament proposed a new format in which the 16 teams were divided into four first round groups (or "pools" as they were then called) of four teams, with the four group winners advancing to a final group stage, playing in round-robin format to determine the winner. The main reason for this choice was money: the organizers had spent a great deal on stadium and infrastructure investment. A straight knockout tournament, as had been used in 1934 and 1938, would feature only sixteen games (including the third-place playoff), while the proposed two-group format would guarantee thirty games, and thus more ticket revenue. In addition, this format would guarantee each team at least three games, and thus provide more incentive for European teams to make the journey to South America and compete. FIFA originally resisted this proposal, but backed down after Brazil threatened to back out of hosting the tournament if this format was not used. In each group teams were awarded 2 points for a win and 1 point for a draw. Had there been a tie on points for first place in a group, then a playoff would have been held to determine the group winner. The entire tournament was arranged in such a way that the four first round groups had no geographical basis. Hence, several teams were obliged to cover large distances to complete their program, although Brazil was allowed to play two of its three group matches in Rio de Janeiro while its other group game was held in the relatively nearby city of São Paulo. A combined Great Britain team had recently beaten the rest of Europe 6–1 in an exhibition match and England went into the competition as one of the favourites; however, it was not to be, as they went crashing out on 29 June in a shock 1–0 defeat by the United States which, combined with their 1–0 defeat by Spain, led to England being eliminated. Italy, the defending champions, lost their unbeaten record at the World Cup finals when the team was defeated 3–2 by Sweden in its opening match. Because of this defeat, Italy failed to progress to the second round. The final match in group 1 between Switzerland and Mexico was the first time a national team did not play in their own kit. Both teams arrived with only their red kits. There was a meeting held between the Brazilian Football Confederation they tossed a coin and Mexico won so it seemed they would get to play in their own kit. However they gave a nice gesture to the Swiss by allowing them to wear their kit so Mexico did the honors of changing. The local team that lent out their shirts was Esporte Clube Cruzeiro from Porto Alegre. The shirts had vertical blue and white stripes. The final group stage involved the teams who won their groups: Brazil, Spain, Sweden, and 1930 FIFA World Cup champions Uruguay, who were making their first World Cup appearance since winning the inaugural tournament. The World Cup winner would be the team that managed to finish on top of this group. The final group's six matches were shared between Rio de Janeiro and São Paulo. Brazil played all its final group matches at the Estádio do Maracanã in Rio while the games that didn't involve the host nation were played in São Paulo. Brazil won their first two matches with a 7–1 thrashing of Sweden and 6–1 rout of Spain. Before the decisive match, Brazil was sitting on top of the final group and had one game left to play against Uruguay, in second and only a point behind. On 16 July, before a huge home crowd of 199,954 (some estimated as 205,000) in the Estádio do Maracanã, the host nation only had to draw against Uruguay and the trophy would be theirs. 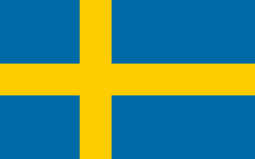 After such crushing victories over Spain and Sweden, it looked certain they would take the title, especially as the home nation went ahead in the second minute of the second half, thanks to a goal from Friaça; however, Uruguay equalised and then with just over 11 minutes left to play, went ahead 2–1 when Alcides Ghiggia squeaked a goal past Moacyr Barbosa, and Uruguay was crowned World Cup champions for a second time. This stunning defeat surprised Brazil and is referred to as the Maracanazo. The average attendance of nearly 61,000 per game, aided greatly by eight matches (including five featuring hosts Brazil) held in the newly built Maracanã, set a record that would not be broken until 1994. Not counting the Maracanã matches, the average attendance was a still-impressive 37,500; however, the only venues that saw crowds comparable to or greater than those in recent World Cups were the Maracanã and São Paulo. Other venues saw considerably smaller crowds. Six venues in six cities around Brazil hosted the 22 matches played for this tournament. The Maracanã in the then-capital of Rio de Janeiro hosted eight matches, including all but one of the host's matches, including the infamous Maracanazo match in the second round robin group that decided the winners of the tournament. 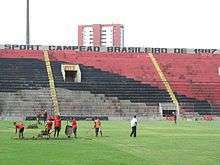 The Pacaembu stadium in São Paulo hosted six matches; these two stadiums in São Paulo and Rio were the only venues that hosted the second round robin matches. 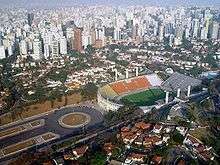 The Estádio Sete de Setembro in Belo Horizonte hosted three matches, the Durival de Britto stadium in Curitiba and the Eucaliptos stadium in Porto Alegre each hosted two matches, and the Ilha do Retiro stadium in far-away Recife only hosted one match. For a list of all squads that appeared in the final tournament, see 1950 FIFA World Cup squads. With eight goals, Ademir is the top scorer in the tournament. In total, 88 goals were scored by 48 different players, with only one of them credited as an own goal. 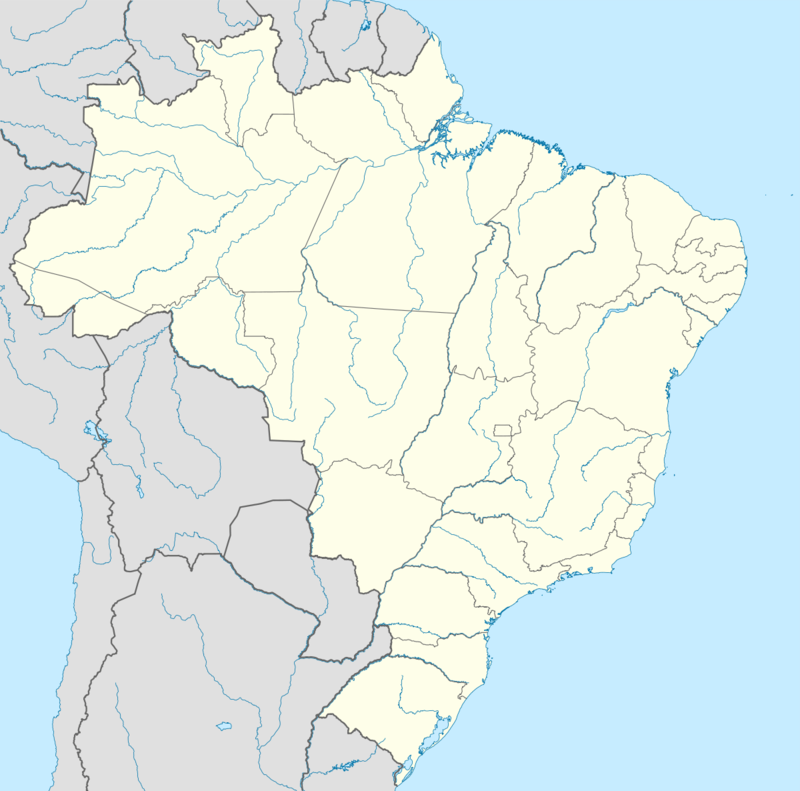 ↑ The Portuguese pronunciation is [ˈkwaʁtu kɐ̃pjoˈnatu mũdʒiˈaw dʒi ˌfutʃiˈbɔw], in today's standard Brazilian pronunciation. ↑ "Brazil's first World Cup draw". FIFA.com. 3 December 2013. Retrieved 4 December 2013. ↑ "1950 FIFA World Cup Brazil – Overview". FIFA. Retrieved 5 July 2014. ↑ Fansworth, Ed (29 April 2010). "The US and the 1950 World Cup". The Philly Soccer Page. Archived from the original on 13 May 2013. Retrieved 14 June 2014. Lisi, Clemente Angelo (2007). A history of the World Cup: 1930–2006. Lanham, MD: Scarecrow Press. ISBN 978-0-8108-5905-0. Retrieved 27 August 2010.